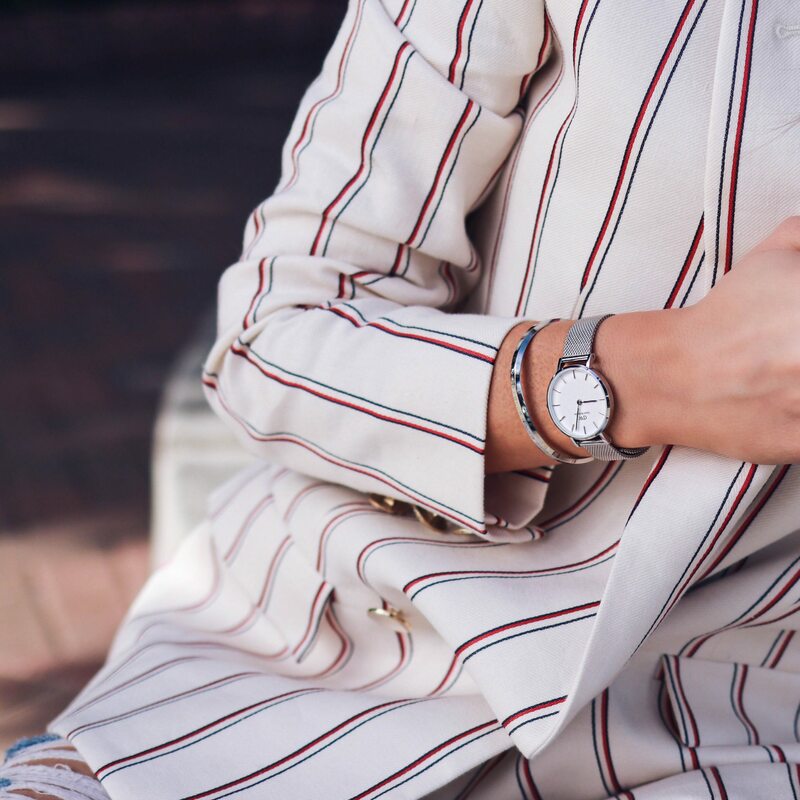 Daniel Wellington Review and Daniel Wellington Coupon Code: The Classic Petite Sterling in 28 mm with its matching silver bangle. This Spring, Daniel Wellington is offering a free strap and 15% off with my code JULIACOMIL on DanielWellington.com. Daniel Wellington concept is to create an elegant, minimalist and versatile watch. I felt in love with its timeless designs and interchangeable straps. I bought the Classic St. Mawes some years ago and I also owned the Black Classic Reading Watch (see the previous review here) and the Classic Petite Ashfield (see review here). I love the Classic Petite Sterling in 28 mm. It is effortlessly chic and feminine with the 28 mm. I have a small wrist so the 28 mm is a good size, it also comes in 32 mm (check this post to see a 32 mm size). I feel that the 28 mm is more feminine on my wrist, 32 mm is also good for my small wrist but a bit larger. For the classic cuff, I am wearing a size small. Daniel Wellington watches retail in the range of $160 to $200. Regarding quality, I did not have any problem with my previous watches, they still work like a charm. The material used by Daniel Wellington is not silver but stainless steel, which makes sense at this price. However, the glass is not made of sapphire, so you need to be cautious to not scratch it. 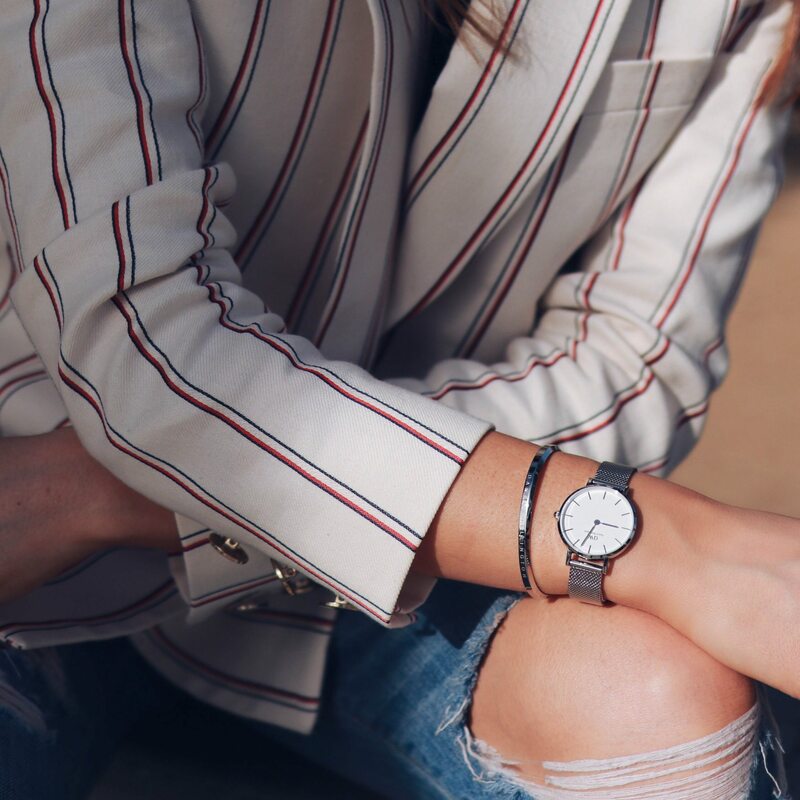 I hope you found this review helpful, and don’t forget to check out the new Classic Petite Sterling collection and cuffs at www.danielwellington.com, you can get a free strap and 15% off with my Daniel Wellington discount code: JULIACOMIL. 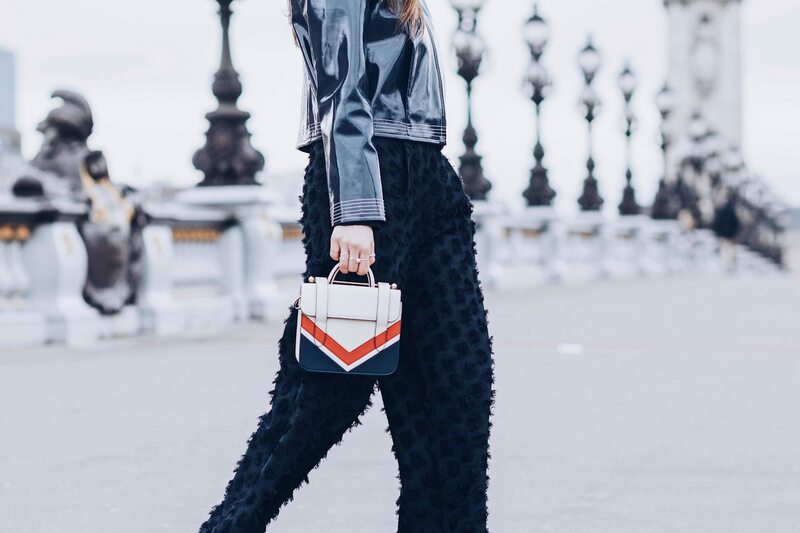 On these pictures, I am wearing a striped blazer from Bash Paris. Pictures in Santa Monica by Julia Comil and Nicolas Miltgen. Disclaimer: Daniel Wellington has gifted me this watch and cuff with no requirement of a blog post. I truly believe this brand is worth knowing and learning about, hence the blog post! As always, opinions are my own. I love how timeless and chic their watches are. Great everyday watch, looks amazing on you! I think it’s a great accessory watch for entry-level watch collector. Its design is incredibly simple so that it can go with any outfits! great review. That watch is absolutely gorgeous. I have a DW and I hardly ever take it off. 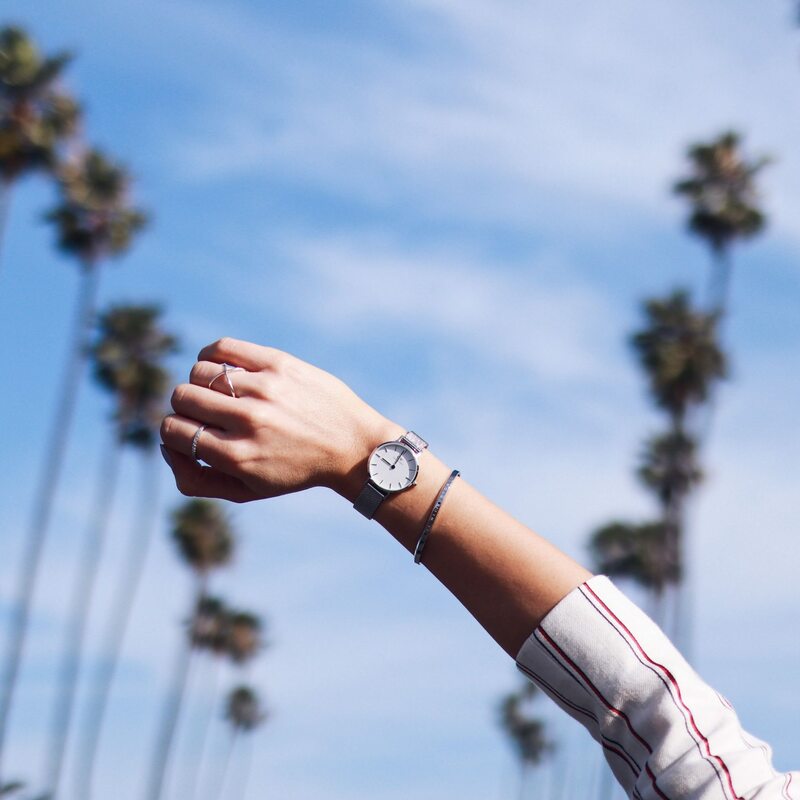 That Classic Petite watch is such a staple! I am loving the way you styled it here. I can’t wait to see you wear it other ways! Love their watches! Such great classic pieces!